Why doesn’t the property boundary line up perfectly with the orthophoto? | First Base Solutions Inc.
Why doesn’t the property boundary line up perfectly with the orthophoto? The orthophoto are generally spatially accurate to double the resolution value. Simply put, if a photo has resolution of 20cm, any point on the photo will be accurate within 40 cm of its true location. For the parcel data, different Land Registry Offices in Ontario were originally drawn to different standards and then later integrated into one dataset that’s now maintained by Teranet. The most accurate being POLARIS (Province of Ontario Land Registration Information System) which is based on surveys, followed by BIM (Basic Index Mapping) which is based on 1:10,000 scale mapping or smaller, and Pre-BIM, which is compiled in areas where good control data is less available, making it the least positionally accurate. In an area where pre-BIM standards are used, it’s not unusual for the property lines to be off by 10 m or more from where you would expect them to lie on the photo. 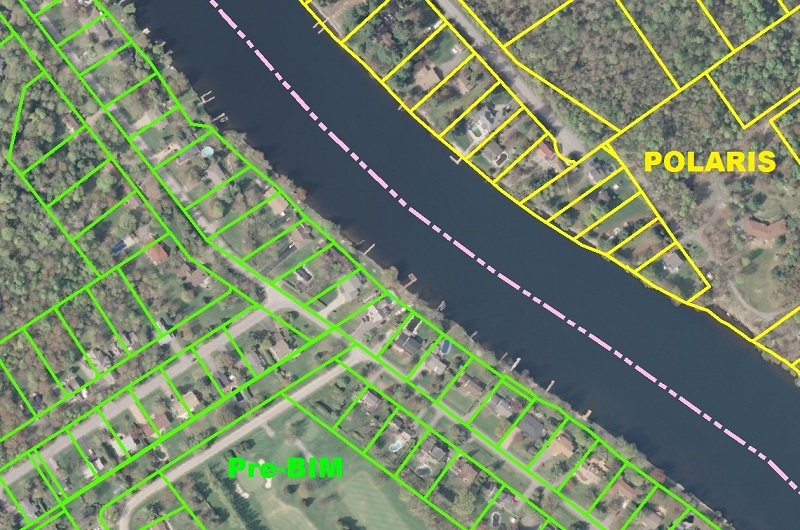 Where your orthophoto and property lines don’t align perfectly, it’s likely due to different accuracy standards used to create one or both of the datasets.